The kernel should detect the USB device. On Linux, lsusb should display a line showing the device. With either command, add the -v option for verbose output and many more details. usbview may provide a detailed graphical user interface for examining USB devices. 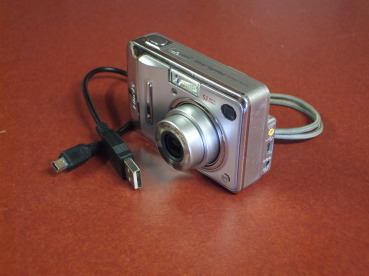 Fuji FinePix digital camera with USB cable. The device will be something like /dev/sd0i on OpenBSD. If, on the other hand, your camera uses PTP, as seems more common on newer cameras, use some user-space tools. Of course, that 004,006, indicating USB bus #4 and device #6, will depend on where you attach your camera. See the lsusb output above for how you can figure out in advance what this will be. 101_FUJI (or however your camera identifies itself). See the gphoto2 manual page for far more. recoverjpeg is a very nice tool. Get it from rfc1149.net or from free(code). If, on the other hand, your camera uses the Picture Transfer Protocol, or PTP, then as far as I know you will have to put the memory card into a reader so it appears as a USB mass storage device. I don't think there's a way of using the PTP interface to directly access or copy the memory. See the gphoto2 manual page for far more, maybe there's a way to image or directly access the memory.